A four- to three-lane conversion can narrow the roadway either physically or visually and may result in reduced speeds. 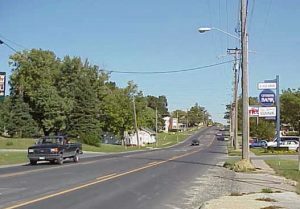 Four- to three-lane conversion in Osceola, Iowa (Wen Li and Alicia Carriquiry/Institute for Transportation). A four- to three-lane conversion is used to reduce an existing four-lane roadway to a 2+1 facility, in which the third lane acts as an alternating passing lane or continuous left-turn lane. Removal of two of the through lanes can narrow the roadway either physically or visually and may result in reduced speeds (Brewer et al. 2001). The treatment can be used for specific sections or along the length of a main road through a small community. An earlier Center for Transportation Research and Education (CTRE) report on the use of four- to three-lane conversions showed moderate reductions in 85th percentile speeds up to 5 miles per hour (mph) and a 60 to 70 percent reduction in the number of vehicles traveling more than 5 mph above the posted speed limit (Knapp and Giese 2001). Crash reductions from 17 to 62 percent were also documented. Corkle et al. 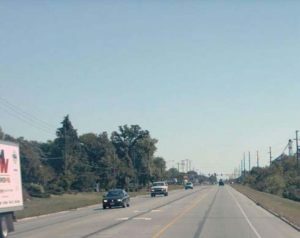 (2001) also evaluated a four- to three-lane conversion in Minnesota on a 35 mph minor arterial road. The researchers reported reductions in both mean and 85th percentile speeds of up to 4 mph. The Crash Modification Factors Clearinghouse provides crash modification factors (CMFs) of 0.47 to 0.63 for all crashes in converting a four-lane roadway to a three-lane roadway. A four- to three-lane conversion is especially applicable to areas where the highway has many access points along the through-town segment. If four- to three-lane conversions are accomplished using pavement markings and the existing right-of -way, the treatment is relatively inexpensive. Brewer, Jim, John German, Ray Krammes, Kam Movassaghi, John Okamoto, Sandra Otto, Wendell Ruff, Seppo Sillan, Nikiforos Stamatiadis, and Robert Walters. Geometric Design Practices for European Roads. Report FHWA-PL-01-026. Federal Highway Administration, International Technology Exchange Program, 2001. Corkle, Jacqueline, Joni L. Giese, and Michael M. Marti. Investigating the Effectiveness of Traffic Calming Strategies on Driver Behavior, Traffic Flow, and Speed. Minnesota Local Road Research Board, Minnesota Department of Transportation, St. Paul, MN, 2001. Knapp, Keith and Karen Giese. Guidelines for the Conversion of Urban Four-lane Undivided Roadways to Thru-Lane Two-Way Left-Turn Lane Facilities. Center for Transportation Research and Education, Iowa State University, 2001. Li, Wen and Alicia Carriquiry, Four-Lane to Three-Lane Conversions tech transfer summary. Center for Transportation Research and Education, Iowa State University, 2006.